Recently my household has become gluten-free. The Boyfriend, who actually needs to go gluten-free, is finding this all rather depressing as the entire bread aisle and biscuit and cake aisle in Sainsbury’s are now off limits to him. I however am seeing it all as an opportunity to get experimenting. I’m definitely more of a cook than a baker but since the range of gluten-free bread and cakes available in the supermarkets is pretty limited I’m taking the opportunity to make things from scratch a little more. 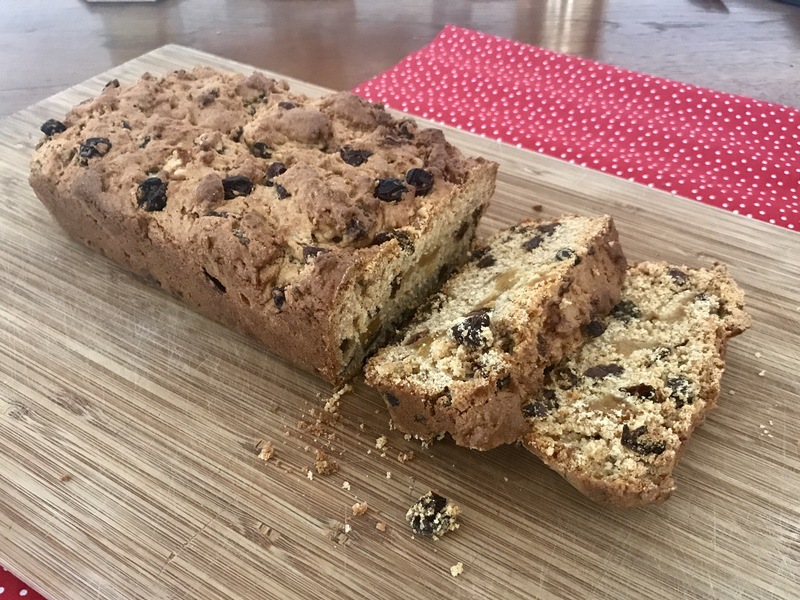 Fruit cakes have never been my favourite, it’s not something I’d choose when there are other options but I had a lot of dried fruit to use up from various recipes and The Boyfriend quite likes it. However, despite my lack of enthusiasm, I was pleasantly surprised by this recipe. It was quite light and I think the delicate tea flavour really lifted the whole thing and helped to make the fruit not too over powering. This loaf is a little crumbly, but this is something I’m finding with a lot of my gluten free baking experiments. It is early days though so I’m sure with practice and trying out lots of different recipes I’ll get the knack of it! 1. Brew the tea and then pour over the dried fruit. Cover and allow to soak over night. 3. Preheat the oven to 160º. 4. In a large mixing bowl mix together the flour, sugar, spices and orange zest. 5. Add the egg and sunflower oil to the fruit and mix. 6. Fold the wet ingredients into the dry until the thoroughly combined to form a cake batter. 7. Pour the batter into the loaf tin and level out the top with the back of the spoon. 9. Remove from oven and leave to cool before serving.